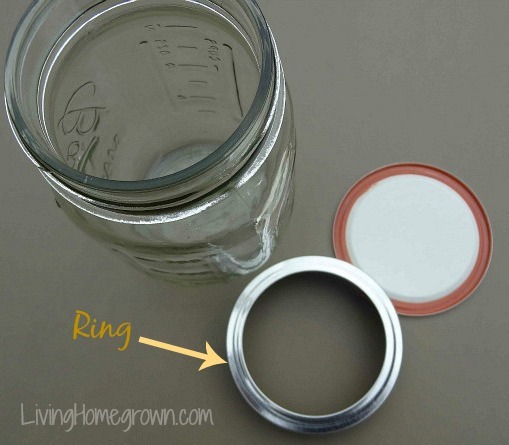 Why Remove Rings From Canning Jars? I’m sure you are familiar with the standard 2-piece canning jar lids. The flat lid sits on top of the jar and the ring tightens around it holding the lid in place as you process the jar in either a water bath or pressure canner. Most canners use this type of canning lid. But did you know that it is considered unsafe to leave the ring on a canning jar AFTER it has been processed? Sometimes when I mention this to people, I get a deer-in-the-headlights response. I think part of the problem is that few canning books even mention this. Also, most photographs of canned foods show the rings on the jar. Heck, I’m guilty of this myself! I like to photograph the jars while they are cooling (and the rings are on). I guess I am just excited and don’t want to wait for them to completely cool. But doing this gives the illusion that they are being stored that way. Important: Now, let me be clear. The rings DO need to stay on the jars while the jars are cooling down after processing. They should only be removed after the jars have reached room temperature. Do you want to know why ? The main purpose of that ring is to align the lid properly on the jar and to hold it in place while the vacuum seal forms. After that, it has served its purpose. 1) A False Seal: The ring can inadvertently hold a lid on a jar that has a broken seal. In other words, if the vacuum seal is compromised, that ring will make it LOOK like it is okay even if not sealed. Then later, when you pull that jar off the shelf and open it, you may or may NOT be sure if it was already open or not. And depending upon how long that jar has been unsealed, you may not notice that the food is going bad. 2) Rust: Leaving the ring on can lead to rusting of the ring. Have you ever left a ring on and then later had trouble twisting it off because of rust? I have. Then as you wiggle and fight with the ring, you can break the seal on the jar…or was the seal already broken? Hmmm…Reason number one comes back to bite us again. We don’t know if we “just” broke the seal or it has been open for a week or more. 3) Mold: Yes, mold can grow under the ring and that can lead to the vacuum seal being lost. This happens because food sometimes siphons out of the jar during processing and gets trapped under the ring. As it sits, it begins to mold and that mold grows and can push on the edge of lid and break the seal. In fact, after your jars are completely cooled, you should remove the rings AND wipe down the jars to remove any stick residue. Then label the jars and sit them on the shelf. You should also avoid stacking jars on top of each other. Again, many photographs show jars stacked and it gives the illusion that it is okay to leave them like that. But actually the weight of the top jar can break the seal on the bottom jar. And stacking jars will prevent you from seeing if the bottom jar has lost its seal. Now I know it is a pain, but you should try to sit jars in a single row when storing them on the pantry shelf. I realize that this is not always possible. But at least you now understand the reason behind the recommendation. Do YOU leave on the rings? Will you change your ways? And what about stacking? you should remove the jars AND wipe down the jars to remove any stick residue. Then label the jars and sit them on the shelf. Oops! That was a mistake. I’m fixing now. Thanks for watching for typos. I need that! I’ve heard that putting thick/stiff cardboard between stacked jars helps distribute the weight and makes stacking safe. That is a very good suggestion Dianne. I had not heard that one. Thanks for the helpful advice. I’m new to canning and hadn’t heard or read this information. Thank you I have always stacked my jars and left rings on for supporting the bottom jar. Now waiting to see your post on how to do it safer.never to old to learn. Been canning since I was 12 Grandma let me help her. Started with the rubber seals and full lids and the 2 part glass and rubber with wire attached to hold in place.we have came a long way in 64 years. I’m so glad you are here! I’ve canned my whole life too and have so many wonderful memories of canning with my mom. When I am finished with whatever product I am canning, I always remove the rings and wash off the jars to remove any sticky residue and hard water that tends to build up. When the rings are dry, I put them loosely back on the jars. That way the ring is handy when we are eating the product and need to refrigerate it. When the jars are empty, clean and dry, I store my jars with rubber edge of the lid away from the jar rim and the ring loosely on to keep the jars clean until time to fill them again. This keeps dust, spiders and whatever else might find a way into the jars out and also protects the rim of the jars from getting chipped. Another way to keep the dust, spiders, etc out of your clean stored jars is to store them upside down. I use the same box that they came with the corners reinforced with duct tape. The lids are kept separate. If you are planning to enter your canned items in any state or county fairs in Pennsylvania, please check the rules for that specific fair, as some require rings on the jars. Good info Thelma. I didn’t know that some fairs require the rings. Thank you! I’ve heard its okay to stack the jars with a layer of cardboard between them. Yes? No? Yes J – I have not done it myself, but you are correct. The theory is that stacking the jars without rings but a layer of cardboard prevents most of the issues I describe in this post. The idea is that you are gently distributing the weight without putting undue pressure on the lid. Everyone swears by this method. Glad I will be getting new information. Been canning for years but don’t always keep up with new regulations and safety issues. Glad you are on top of it for us. I was told by my dear friend Gay, years ago to remove the rings when storing my jars. She also told me to put heavy cardboard or a thin wood to make a sort of shelf with stacking the jars. I love the look of the jars with the rings so I have not taken them off. Now with the increase cost of rings and seals I have been thinking I might have to remove them so they will last longer. Also , I was just reading the book “The Art of Fermentation” by Sandor Katz and it was recomended somewhere in the book to use coconut oil on rings when frementing to help prevent rusting. I may try this when storing my ring as I live on the Oregon Coast and we have a real rust problem here. I am new to this blog ( or any blog this is my first ) and I am very happy to find this information site. Thank You! So glad you are here. Yes, stacking cardboard is how many people avoid the issues I describe in this post. I did not know about Sandor Katz recommending coconut oil. I think that is a great idea! Thanks for telling me. I stack mine in a single layer. I don’t place jars on top of each other. But I know many people who place cardboard between the layers and stack that way. But you must be careful not to disturb the seal. My husband and I put a thin piece of wood between the jars when we stack them. We’ve canned various things long enough that we seem to have a mix of medium and tall pints and the wide mouth pints are shorter than both, so it ends up being uneven! We leave rings on, always thought the only reason was to prevent rust. I like the suggestion of taking them off, wiping and drying, then putting loosely back on. Also has anyone used the reusable Tattler lids? I don’t care for them very much. Mtheynseem to fail at a higher rate than regular metal ones. And it’s harder to tell if you got a good seal since it doesn’t flex and ‘pop’. They take some getting use to. I was able to get good seals with practice. I know some people love them. But I think I prefer the standard lids. However, I understand why someone would want the Tattler. My sis & I have taught food storage classes for 8 years for community college and church groups. We teach the “open the lid with a quarter or inverted spoon” method, thus never compromising the shape of the lid as happens when you use a can opener. Thus the lids can be reused over and over and over. We have never, ever had our reused lids not seal! We keep using them until the rubber gets sticky/thins out. Huge money-saver. I have no doubt it worked for you. All I can say is that we are trained that it is the indent from the lid hitting the rim of the jar that compromises the seal. Once indented, it may not hold a good seal (because chances are the next jar won’t line up perfectly with the indent). So it is recommended to not re use a jar lid. The boxes of new lids clearly say they are a one use item. Please do not reuse canning lids. I don’t recall exactly how I came to know about it, but I have discovered a wonderful little kitchen tool that every canning kitchen should own. It is called a JarKey, made in Denmark and there is one called JarPop. They’re available on Amazon and some good hardware stores for $5-7. They pop lids off so easily and I have never had any damage to any of my lids since I started using one. They’re especially nice for arthritis sufferers as well. Hope this helps all those that like to reuse lids too. Very cool LaVonne. I had not heard of that. Thank you. I don’t reuse my lids for canning (because of the indent in the gasket), but I do like to reuse them to store things in my jars. This might come in handy. I just canned pears for the first time the hot pack method but did not do the water bath. All of my jars sealed. Are they going to be safe to eat? Please confirm what you mean by “just”. 24 Hours? a week? or two? or more? Made numerous batches of bread & butter pickles over the past month or so. Have been advised that they need to be waterbathed. Is it still OK to do them? Does it make any sense to still do them? If yes, any special instructions due to “age” of the canning? The USDA says that you can reprocess jars that have been canned within 24 hours. I feel that with a high acid product such as pickles, you could go a few days before reprocessing them. But the USDA does not advise going weeks before reprocessing. Honestly, it has a lot to do with the individual recipes. Some brines are higher acid than others. If the pickles have been kept under refrigeration, then you most certainly could reprocess them. Refrigerator pickles would not have bacteria growing due to the high acid AND the refrigeration. We are not worried about botulism with bread and butter pickles (unless they are a non-standard recipe that is low acid). The concern is over other bacteria and molds growing. Once homemade bread and butter pickles are opened, they are supposed to be refrigerated for that reason. I have only been canning for three years now but remember helping my grandma when I was a child. I remove the rings from the jars because I remember her jars coming up from the root cellar with rusted rings and having a devil of a time trying to get them off – and then they are ruined! What I do is after the jars have cooled and I turn them back right side up – I check each for a seal and then remove the ring from the outside. I have only had it happen once but when removing the ring, the seal broke – that was a good lesson on the whole “false seal” problem. Anyway, after I remove the ring from the jar, I routinely wipe the top of the lid and the sides of the jar around the lid with rubbing alcohol on a paper towel. This removes any leaked “gunk” during processing and provides a nice clean surface for labeling. Yes! It is only a problem if they were indented from the rim of the jar. If you never put them on a jar, they are fine. Thank you for all the information. I am going to try the different methods of taking off the lid without damaging the canning lid. Although I knew about the potential issues with leaving the rings on…. I have been canning for over 4 decades, and have never removed the rings. I have been convinced by your blog that I should do so. I am, however, struggling with how and where I could store the hundreds of rings so that they do not become bent out of shape. How do your store yours? I have a lot of jars and lids too and have stored them in a few different ways. I used to keep them strung on a wire hanging next to the jars. This worked great when I was actively canning, but they got dusty the rest of the year. So now, I keep them in clear plastic boxes or baggies by size so that I can easily see which is which. The boxes work best for me. I keep the rings in one box and the flat lids in another. They don’t seem to get bent up this way. The trick is to not put them into the boxes until they are completely dry so they don’t rust. After processing and waiting the 24 hours I remove the rings, clean off the jars, make sure everything is dry, then put the rings back on by a quarter or half turn, just enough to catch. Then I can stack another jar either full on or split between two lower jars without applying any pressure to the sealed lid on the bottom layer. I check to make sure the bottom of the top jar is not touching the lid of the bottom. I am trying to empty old things canned. I have some jars from 2009 with the rims on and I cannot get them off. I tried soaking the jars in hot water. Any ideas? I discovered exactly what you are talking about when leaving the rings on home canned foods…..mold. Last year’s canned foods were put inside a very large wooden storage unit with doors that closed. I never removed rings before and never had a problem. I really didn’t have a problem until it got very warm in this area for an extended period of time and the basement heated up. Prior to that, the rings never showed signs of mold. Upon doing an inventory of the foods, I discovered that some of them had mold starting to grow around the bottom of the rings. I quickly removed the rings, cleaned every jar it with Clorox water; rinsed and dried each of them and checked the seals…they were just fine. I also put the rings in a solution of Clorox water to kill any mold that may be on them. My questions is this….are those foods okay to use?…the seal was not broken on any of them, the mold had just recently formed because of the heat, each jar was cleaned with Clorox water and rinsed. Although I think that the food inside the jars was not compromised, and as much as I would like to keep my inventory, I really do not want to harm anybody with home canned foods that may be tainted. I like the look of those shiny gold and/or silvers rings on the shelves, however, for safety sake, I will definitely remove rings in the future. Thanks so much for telling me Val. Glad you are getting value from the info! I’m new at this game. I’ve made marmalade once before that set pretty hard but still got eaten:) Oversupply of citrus can make you try weird things to get rid of it. Was still well received by my English and Sicilian neighbours. I’m sure they were being kind. My question to you is where I’m from they don’t seem to do this ring and lid thing but I am interested to know more. I asked my father(grandmother isn’t with us anymore) how she did it when she was making jams, pickles and chutney and it was always put it in hot in the hot jar and get that “used” lid on (sterilised in hot water) and use it at your leisure. I can’t remember anyone ever getting sick and assume it’s because they were all high acid, extra sweet and extra acid from vinegar that saved us. However they were still always better than anything I can get from a shop especially the corn relish and the fruit chutney, jams were a bit either way, probably too sweet if anything and lacking the fruit flavour but still ok..wouldn’t dare complain. What’s mostly on offer here now is new lids that will pop when they are sealed by having the jars sterilised in a water bath and then adding the hot ingredients and whack the lid on. No inversion, just add it hot and let the vacuum happen naturally. I can see the problems with this, if it’s not hot enough or leaving the mix to cook too long. I’ve been on the sauerkraut with any protein lately. My daughter is half lebanese and she whacks lemon juice on all her protein. That has led me onto this..the sour is actually quite nice but not quite balanced for my taste. A balance of sweet,sour and heat would take protein to the next level. Salt I can add at anytime. Is the second boiling necessary would you say or should the acidity keep it ok for a good period even if the seal isn’t perfect especially the acidic stuff? Alkaline foods I can understand the need for removing every bit of oxygen. I’m not a big worrier about food poisoning myself but understand some people are. Carey says “after I turn them back right side up”. What does that mean, are they supposed to be lid down while cooling? So how do you reseal the jars after breaking the seal (ie. on jelly) or when only using a portion of the product you canned? I think you are asking if I ever reprocess the jar after opening it? No. That is not recommended. Once open, it is supposed to stay unsealed and must be used within a reasonable amount of time and kept refrigerated. I’ve never heard of this. Thanks so much for posting. Next time we can I’ll remember it. Simple plastic coated wire racks/shelves that are tall enough to sit the first row of pint/quart jars under will provide support for the next level of jars without them touching each other. What great advice! Thanks for tge tips. Now to build more shelves, so we can avoid stacking! The shelf life of jams can vary with each recipe with the biggest difference between high sugar and low sugar jam. Let me explain so you can determine the shelf life of yours. Most high sugar jams will be fine for up to a year. After that time, they do not suddenly become unsafe. But instead, they rapid lose their texture and color at around 10-12 months. So that is why canners are told to consume their jam within a year. All canned food also loses its nutritional value around that time frame. So around 10-12 months, a jam can become dark and soft or even runny. But if it still has its seal, then it should still be safe. Keep in mind that when we can food, we are really just slowing down the decomposition of that food. We are not stopping it completely. In most cases, a year is the longest you want to keep and use that jam for all the reasons I gave above. However, low sugar jams have a shorter shelf life. They are best between 6-8 months. The reason is because sugar is a preservative. It helps retain the color and texture of that jam. Without it, the jam breaks down sooner. But again…the jam does not suddenly go “bad”. It just loses it’s color, texture and even flavor to the point that is just not that appetizing after that time. Now, just to make things even more uncertain (ha ha)some fruits and some recipes may lose color and texture at any time. It could be the fruit is more delicate or that particular recipe just didn’t have a good gel, etc. So there is always the possibility that a jam will start to shift earlier than a year. When your jars are ready to use, and you don’t use all of the fruit in the jar, what type of lid to you put back on the jar. 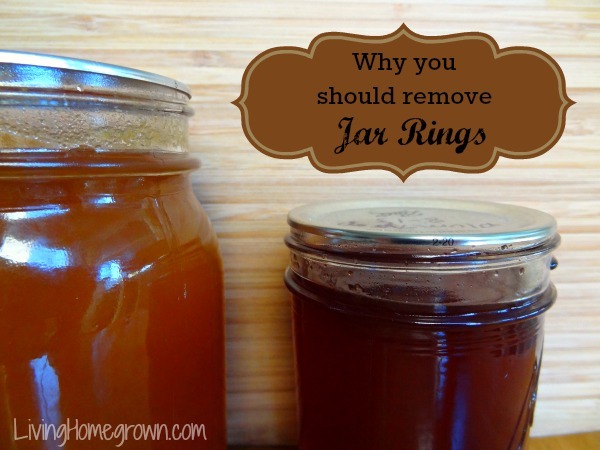 My question is: Should you store your jars upside down after removing the rings? No. You should not store your jars upside down. Store them right side up – always. How do you store empty jars? I don’t want to have to wash on every time I go to use it. Hi Gina – Here is a post on streamlining your canning and I show how I store my canning jars in plastic boxes. Most informative content, thank you! I too am new at canning. My first session was French Brandied Cherries, (being in Washington state) a mere 2 weeks ago. I promptly removed the rings from my half-pints today. A couple of jars in the batch have fuller volumes, post water bath. I’m a nervous nellie ’bout these things. Every thing looks great, (all lids in place), just want to be sure. Is there a test kit one can send away for? (Retired hospital pharmacy). I remove my lids, wash them and let them dry. They last longer and don’t rust on my jars. I understand why we should remove the rings for storage. But what do you do when you give jars of jam or pickles as gifts? Without the screw band, the person you gave it to has no way to close the jar after eating part of the contents. Hi Bridget – When giving as gifts, I always include the lid (either attached loosely or tied on with a ribbon). And I let the person know that if they are not going to open it for awhile, they should store it with the lid off. 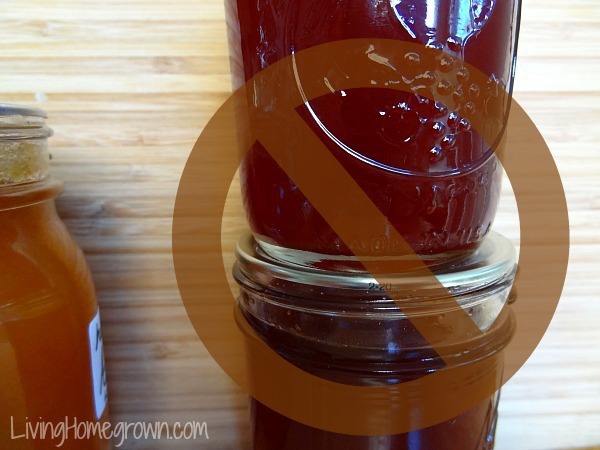 The three reasons you give for removing the rings after canning are correct . However I do leave the rings on as an added benefit . After canning spaghetti sauce I leave the jars out too cool for 24 hours . I then removed the rings and thoroughly dry the top of the seal and the inside threads of the ring . Once everything is thoroughly dry I reinstall the rings with just one eighth of a turn. This prevents the seal from becoming compromised in the event they get bumped in the cabinet throughout the course of the year . I store the jars in a dry climate controlled cabinet and have had tremendous success over the years . I would not recommend leaving the rings on if you were going to store your jars in a damp or humid environment such as a cellar. WOW just found this blog didn’t know how much I didn’t know. Thanks. I walked into a women’s house and her cans had no rims. It all began from there and now I’m here. I had to find out for myself!